We specialise in Cross Training Programs at Wossobama Gym. Cross Training refers to a mixture of fitness training to improve your results. A person that performs mixed training at whatever level, training in sports other than the one that the person regularly trains in is cross training – normally with a goal of improving overall performance as well as burn more calories, change body shape positively, improve conditioning, prevent injuries and promote active recoveries. 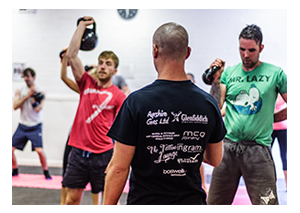 Basically cross training is a great way to train and improve your health and fitness which in turn will help you achieve your goals. So if you prefer to use cardio equipment or run only perhaps you should consider training in classes or embarking on one of our specialised cross training fitness programs. Likewise if you only lift weights you should consider mixing up your training. Here are just a few examples of Cross Training activities you can use to enhance your own training at Wossobama Gym. – Cross Training Programs developed by us – Guaranteed Results. Ask staff for programs and information, we are here to help you achieve all your goals.